Conveniently located in the parade opposite the Zebra crossing in Sunninghill High Street. Our philosophy is to offer an education in tanning and have a sunbed for all skin types. To that extent the salon offers a range of State of the Art sunbeds - both stand up and laydown, all housed in luxurious private cubicles, and our tanning consultants are trained to The Sunbed Association NVQ programme. Hapro X10 - our biggest and most luxurious machine. Fitted with a tube producing higher levels of UVb ensuring a deeper penetration and longer lasting results. Sessions from £7. Hapro X7 - the X10's baby brother. This smaller canopy is fitted with the same great tubes but is a smaller and more compact machine and great for those tanners on a budget. Sessions from £4. 2 x KBL 6800 - the ever popular megaton beds are a luxurious tanning experience. They are fitted with tubes emitting a higher balance of UVa for a more immediate colour. Sessions from £6. UWE iDome - the stand up. 48 x 200w tubes of pure power. For those who want an all round even tan. Sessions from £5. Whatever your reason for tanning - Pre/post holiday, Vitamin D production, skin condition, or you just want to look and feel good, we hope that you will choose our salon as the place to visit. 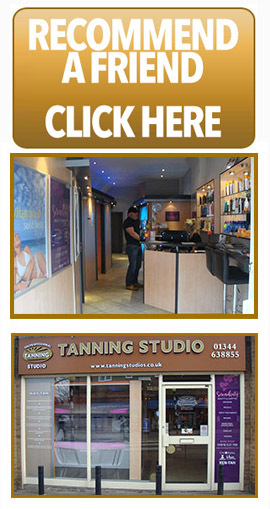 We offer fantastic money saving courses or pay as you go tanning. Please call in for our latest prices and seasonal course offers. We also have the largest selection of accelerator lotions, SPFs, teeth whitening products and slimming pills. To book an appointment call us on 01344 638855 Please note we CANNOT accept bookings by Facebook and email.